The streaming video is below, but first, a few words to place it in context. 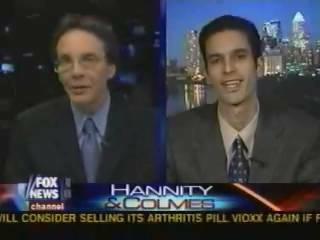 After I was fired from the University of Pennsylvania for no greater crime than having documented certain facts, I was invited to talk about this on the interview show which (I am told) has the highest ratings: Hannity & Colmes, on FOX-NEWS. As it turned out, however, these top-rated interviewers didn't want to talk about the reasons I was fired. Instead, they wanted to talk about my views on 9-11. As you will read in greater detail here, I was fired from the University of Pennsylvania for publishing documentation that refutes the NATO and mass media version of events in the civil wars in Yugoslavia, and because I published documentation that the controlling core of the PLO, Al-Fatah, was created by a leader of Adolf Hitler's Final Solution, and chartered to continue the extermination of the Jewish people. Not content with firing me, the University of Pennsylvania made it impossible for me to teach my highly praised course Psychology of Ethnicity in the time that remained in my contract. The reason? The university objects to the fact that in this course I document for my students how the entire IQ-testing literature was created with frauds concocted by the leading propagandists of the American eugenics movement, the point being to attack the working classes as supposedly stupid, directing the attack most ferociously against blacks, in recent times. (This is the same eugenics movement that also spawned German Nazism.) But about my views on 9-11 nobody at the University of Pennsylvania ever complained. I doubt that most people even knew what my position was. Certainly, nobody seemed to care. And that makes perfect sense, because I am not a 9-11 scholar. And yet the show's hosts wanted to talk about...9-11. Aside from this curiosity, you will notice at the beginning that host Alan Colmes introduces the main question the show intends to ask: "How far should academic freedom go?" In other words, there isn't even the pretense here that the journalists at FOX-NEWS ought to be defending freedom of thought and expression. Rather, the focus is on whether academics such as myself should be allowed to document facts and teach them at all. The rest of the interview is certainly consistent with that thrust. Finally, the context of how I came to give this interview matters to our interpretation of its abrupt end. After FOX-NEWS begged me to promise that I would not appear with another news service before I appeared on theirs, they told me that the interview would last a full half-hour. They seemed excited. 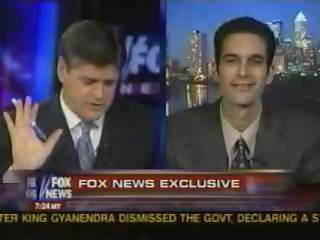 And indeed, FOX-NEWS gave my interview top-billing as a "FOX NEWS EXCLUSIVE", and announced it in commercials for a good while before the show aired. Consistent with this, as you will see, the words "FOX NEWS EXCLUSIVE" appear almost throughout the interview, in proud red, in the bottom half of the screen. And yet, after all that pomp and circumstance, less than six minutes into the interview I was unceremoniously yanked off the air in mid-sentence, and so quickly that the camera didn't hear me say good-bye. You may judge for yourself whether this had anything to do with the failure of Hannity & Colmes' absurd efforts to talk about 9-11 and to defend the University of Pennsylvania. Copyright 2005 Fox News Network, LLC. COLMES: Welcome back to "Hannity & Colmes." I'm Alan Colmes reporting from Dallas tonight. Still to come, why did a California teacher tell one of his students to get psychological treatment for his pro-American views? The student speaks out tonight. And later, a seventh grade teacher's anti-war assignment has outraged some North Carolina parents. You'll meet one of them. And first a controversial professor at the University of Pennsylvania says 9/11 was an inside job. He also claims NATO framed Slobodan Milosevic, and he's tried to convince his colleagues that the United States is a secret enemy of Israel. How far should academic freedom go? Joining us now in a "Hannity & Colmes" exclusive is Professor Francisco Gil-White. Professor, thank you for being with us. FRANCISCO GIL-WHITE, PROFESSOR, UNIVERSITY OF PENNSYLVANIA: Thank you very much. COLMES: Are you concerned, in the wake of what happened with Ward Churchill, about your own academic freedom? GIL-WHITE: Well, I think there's been a misunderstanding. I'm being fired from the University of Pennsylvania for defending Israel and for documenting that the accusations against the Serbs were fabrications. My course, Psychology of Ethnicity, has been canceled because I document how academic psychologists attack blacks, using phony I.Q. tests. Nobody has objected to anything I have ever said about 9/11. It's got nothing to do with that. COLMES: The school is not saying that. The school is claiming that that is not why you're being fired, that it's not because of the content of your class and that it has nothing to do with your free speech, that you had given -- been given a one-year extension. They're now not continuing that. But they are denying what you said is true. GIL-WHITE: Well, I was not expecting the university to confess. But shortly after I went public with the threats that I had been receiving from senior faculty member Paul Rozin, telling me to stop publishing material defending Israel and defending the Serbs, or I would lose my job... shortly after I published those threats and explained what they had been doing to me, I received anonymously in my mailbox the secret documents that were used in the reappointment process. COLMES: Well, you accused him of being an agent, didn't you? You accused the professor you just mentioned of being an agent of U.S. intelligence working to undermine Israel, according to the stories that have come out about this. GIL-WHITE: That's right. That's inaccurate. I never accused Ian Lustick of being an agent of U.S. intelligence. What I did was report what Ian Lustick explains himself on [his] CV. Ian Lustick, right after he got his Ph.D., got a job at the State Department at the Bureau of Intelligence and Research, where they make sure that U.S. intelligence activities further U.S. foreign policy. And after that, [as] Ian Lustick also explains in his CV, he has been a consultant for the National Security Council, [the] National Security Agency, the CIA, and so forth. HANNITY: Mr. Gil-White, Sean Hannity here. Did you or did you not call the September 11 terrorist attacks an inside job, sir? GIL-WHITE: Yes. But that has nothing to do with why I'm being fired. HANNITY: Let me -- Hang on a second. Did you or did you not write articles alleging that NATO framed Slobodan Milosevic? HANNITY: Hang on. I'm not here to dispute this. I want to -- I want to get your track record on the record. Did you or did you not try to convince your colleagues that the United States is the secret enemy of Israel, sir? HANNITY: OK. They're saying that this has nothing to do with those opinions, but I want to address those opinions. You really say that there's an inside job that -- about 9/11? Explain your little theory here. HANNITY: You said 9/11 was an inside job. You just admitted to me. What do you mean when you say it's an inside job? GIL-WHITE: Well, the reporter for the "Philadelphia Inquirer," Patrick Kerkstra, asked me whether I agreed with the views expressed on Emperor's Clothes concerning 9/11. I haven't done any real research on 9/11. Jared Israel has. I agree with his conclusions, and that is, indeed, the core of his argument. HANNITY: Look, you have every right to do it. But you know something? You ought to know; you're a professor. There's no constitutional right for you to work at a particular campus. They don't have to hire you. What the university is saying is that there are questions that have emerged about your researching, about your teaching techniques, about your ability to get along with your colleagues. There are parents that are upset that these fringe opinions of yours, they don't want their kids indoctrinated into your point of view. Certainly you ought to understand that they have every right to say you don't meet the standards we want at this university. Why wouldn't you just accept that? GIL-WHITE: Well, again, I think you're laboring under a misunderstanding. Nobody has ever objected to anything I have ever said about 9/11, and I don't talk about 9/11 in my courses. HANNITY: I understand that. But what they say -- I just got done telling you that their complaint is about your researching, your teaching, your ability to get along with your colleagues. For example, when you asked -- it was reported, the department curriculum, a list of questions and concerns about a course, you refused to address them, they say. Is that true? HANNITY: They're lying in the paper? GIL-WHITE: Yes. The "Philadelphia Inquirer" article is replete with inaccuracies. There's almost nothing true in it. When I received a list of complaints about my course, Psychology of Ethnicity, it was clear that the complaints was -- were two. The main complaints were two. COLMES: We're just out of time, professor. I appreciate you coming on the program, sir. Thank you very, very much. Still to come tonight, why did a California professor tell one of his students to get psychological treatment for his pro-American views? And then, what would you do if your child was asked to write an anti- war letter to President Bush? An outraged parent speaks out about that. And television legend Art Linkletter has plenty to say about Bush's plans for Social Security. “HOW DID THE ‘PALESTINIAN MOVEMENT’ EMERGE? The British sponsored it. Then the German Nazis, and the US.”; Historical and Investigative Research; 13 June 2006; by Francisco Gil-White. The following letter was sent in reply to the UPENN psychology department's attempt to gut my course Psychology of Ethnicity merely because I was teaching my students the material in "Resurrecting Racism" (see below). [3a] Ian Lustick begins this letter by reminding the psychology chairman that the point was to comment on my research and teaching so that the psychology department could decide whether or not to reappoint me to a second contract. But instead of doing that he concedes that he knows nothing about my teaching, and very little about my research (though he does praise the little he knows). Then he proceeds to complain about the fact that my journalistic work exposes various terrorists groups, namely the PLO (Palestine Liberation Organization), the Sri Lankan Tamil Tigers (LTTE), and the KLA (Kosovo Liberation Army). Ian Lustick concludes his letter by making clear that my continued employment should be contingent on the psychology senior faculty being able to silence me. "Analyst, Bureau of Intelligence and Research, Department of State: 1979-1980"
"Consultant for the Department of State; consultant/invited lecturer for the National Security Council, National Security Agency, Central Intelligence Agency..."
 "How Politicians, the Media, and Scholars Lied about Milosevic's 1989 Kosovo Speech: A review of the evidence"; Emperor's Clothes; 9 February 2002; by Francisco Gil-White. “Is the US an Ally of Israel: A chronological look at the evidence”; Historical and Investigative Research; by Francisco Gil-White. "Philadelphia Inquirer slanders embattled Prof. Gil-White... Emperor's Clothes Replies"; Emperor's Clothes; 15 February 2005; by Jared Israel, Editor, Emperor's Clothes. The words in red mark the point at which Francisco Gil-White opens his mouth to say good-bye. The camera cuts away.